After a customer makes their first purchase in your connected store, follow up with them to say thanks, ask for feedback, or send them product recommendations. The first purchase automation can help you make a great first impression with your new customers and keep them engaged from day one. In this article, you'll learn how to add a first purchase automation. The From email address you specify for your automation is used on each email in the series. To change the From email address on an individual email, manually update the email's settings. 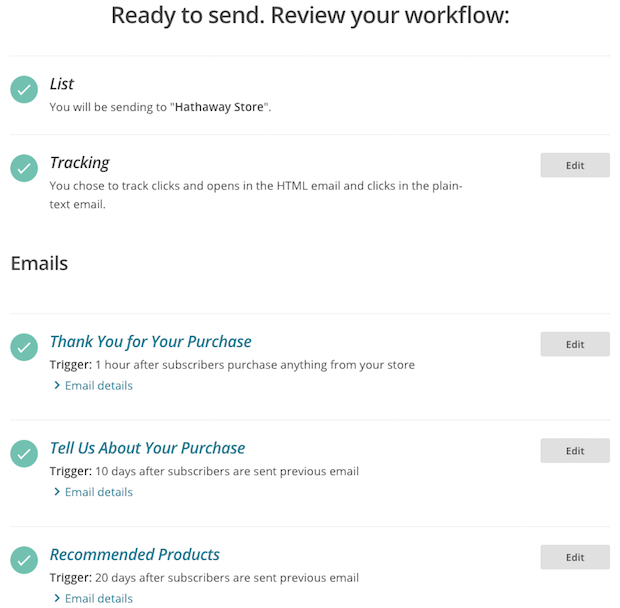 You'll need to connect your store in your Mailchimp account before you can create this automation. On Forever Free and Pay As You Go Plans, a credit is used for each email the automation sends to a contact, including test emails. You'll build this automation by completing a series of tasks, just like you would with a regular campaign. To create the first purchase automation, follow these steps. Now we'll take you to the Emails step where you'll design each email in your marketing automation. 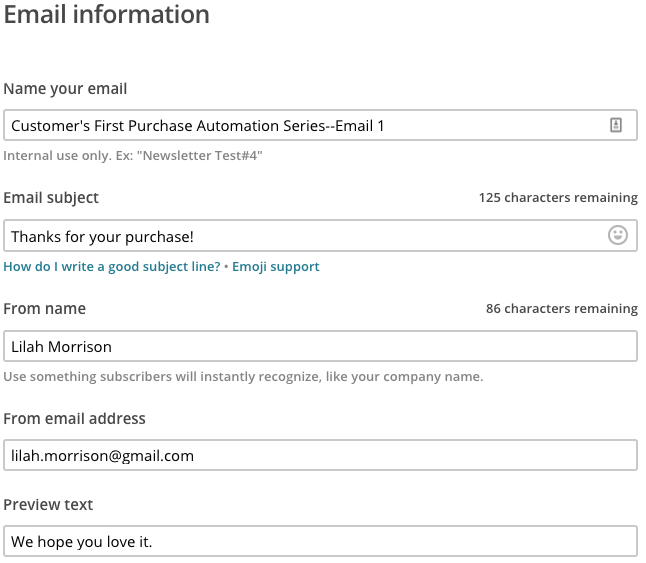 The first purchase automation includes three emails, but you can add or remove emails, or change the settings for each. The default automation features emails with the following triggers. On the Setup step, enter a name for your email, then enter the Email subject, Preview Text, From name, and From email address for the specific email you're working with. On the Template step of the Email Designer, select your template. On the Design step of the Email Designer, design your email. Be sure to preview and test each of your emails. Repeat these steps for each email in your automation. Now that you've designed your emails and configured your workflow settings, it's time to double check everything and start your automation! When you're ready, click Start Workflow to start sending your automation. Send a sequence of reminders to e-commerce customers that leave items in their shopping carts. Encourage your customers to finish their purchases.